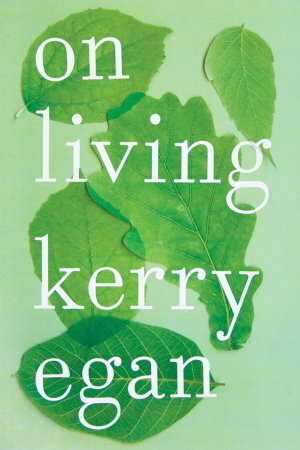 As a hospice chaplain, Kerry Egan never offered sermons or prayers, unless they were requested; in fact, she found, the dying rarely want to talk about God, at least not overtly. Rather than talk, she listened to their stories—stories of hope and regret, shame and pride, loyalty and betrayal and secrets held too long. Most of all, she listened as her patients talked about love—love for their children and partners and friends; love they didn’t know how to offer or wished they’d received; love they gave unconditionally; love they, sometimes belatedly, learned to grant themselves. With each story, she was graced with the chance to witness firsthand what she calls the “spiritual work of dying”—the work of finding or making meaning of one’s life. On Living isn’t a book about dying. It’s a book about living, about making whole the brokenness we all share, by finding courage in the face of fear or the strength to make amends—by becoming profoundly compassionate and fiercely empathetic; by learning to see the world in shades of gray instead of black and white. In this profound, moving, and beautiful book, Egan passes along all these precious and necessary gifts.